The Texas Task Force on Infectious Disease Preparedness and Response is a statewide group of health professionals and educators assembled by the Governor of Texas with the purpose of sharing educational resources on infectious diseases, such as Ebola, MERS, and Measles. During the Ebola crisis of 2014/2015, Kiosk was tasked with developing a brand identity for TexasIDR (short for Texas Infectious Disease Readiness), in addition to developing an online presence that would serve as a reliable resource for health professionals and the public. Under the banner of “fully informed, always prepared,” Kiosk initially launched the txidr.org site in 2015. The site was fast-tracked online, with Kiosk leveraging our existing relationship with the University of Texas to build consensus amongst stakeholders as to the right approach to take when building a curated online destination. 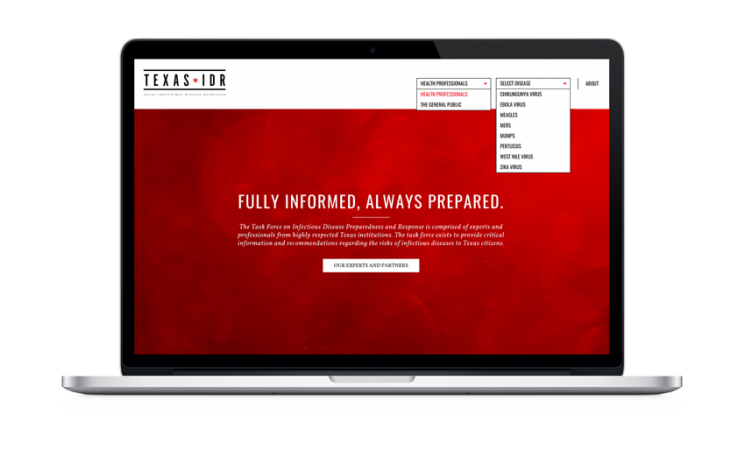 As public concern about infectious diseases like Zika and Chikungunya has grown, alongside a growing body of knowledge about preparedness and prevention, the TexasIDR site has evolved. Today, it provides timely updates to both the public and healthcare professionals on these and other infectious diseases, as new knowledge becomes available or public concern about a topic grows.